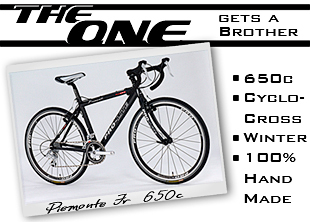 Like the models in the road oriented "The ONE", the Piemonte Jr is designed around the geometry of younger riders who just don't fit a small cyclocross bike. As a sub-model of the Piemonte, it features all the same quality of the Piemonte in the adult models, including mud-clearing rear stays and cyclo-cross specific front and rear brake attachments. Naturally, this makes the bike perfect for winter use as well. As with every Pro-Lite bike, the frame and wheels are 100% hand made in the largest exclusively hand-built wheel factory in the world. Made with 7005 Aluminum alloy, it is the perfect balance of weight, strength, performance and price. We are accepting orders now from distributors and vendors. Pro-Lite - We make what you need.